Auman “Sonny” Medley, age 87, was lifted from us on June 23, 2018. He was known by many as Leroy or Med. He grew up in St. Louis, MO as the second eldest of eight children to Mamie and Auman Medley. Sonny and sister Louise remained in St. Louis after the family moved to Galena, KS in 1944. He joined the family after graduation from high school in Galena. He proudly served our country with the U.S. Army during The Korean Conflict as a military police officer in Heidelberg Germany. Upon his honorable discharge from the army, he became a chemist with the Jayhawk Plant, Spencer Chemical in the nuclear fuels lab. He graduated from Kansas State Teachers College in 1970. 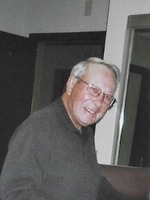 He was most recognized as the industrial arts teacher at Carl Junction High School from 1970 to 1991. Upon his retirement, he continued to build houses, kitchen cabinets, travel, fish, and be a friend to many. He and Judy Mercer married in 1996 and shared the past 22 years together. He married Kathleen Stone June 1956 who preceded him in death in 1987. He is also preceded in death by siblings Lou, Betty and Norma. He is survived by his son Chris, spouse Judy, siblings Delores, Wayne, Robert and Clifford; and many nieces and nephews. In lieu of flowers, the family has requested donations be made to the Wounded Warriors Project or the Auman & Kathleen Medley Endowed Wood Technology Scholarship (Pittsburg State University). Services will be held at Mason-Woodard Mortuary Tuesday June 26, 2018 at 2:00 pm. The family will receive friends and family on Monday June 25 from 7:00 pm to 8:00 pm at the mortuary. Arrangements have been entrusted to Mason Woodard Mortuary & Crematory.